International Dance Day was founded in 1982 by the Dance Committee of the International Theater Institute. This date was chosen to commemorate the birthday of Jean-Georges Noverre, who was born in 1727 and is credited with creating modern ballet. Today’s holiday encourages people to celebrate dance and “revel in the universality of this art form.” There are so many styles of dance to watch and participate in. Today, enjoy a performance or find a venue where you can kick up your heals in your favorite kind of dance! The rhythms of dance and the cadence of poetry create a natural pairing as these seventeen poems that celebrate the moves, music, and thrill of dances from around the world demonstrate with toe-tapping joy. 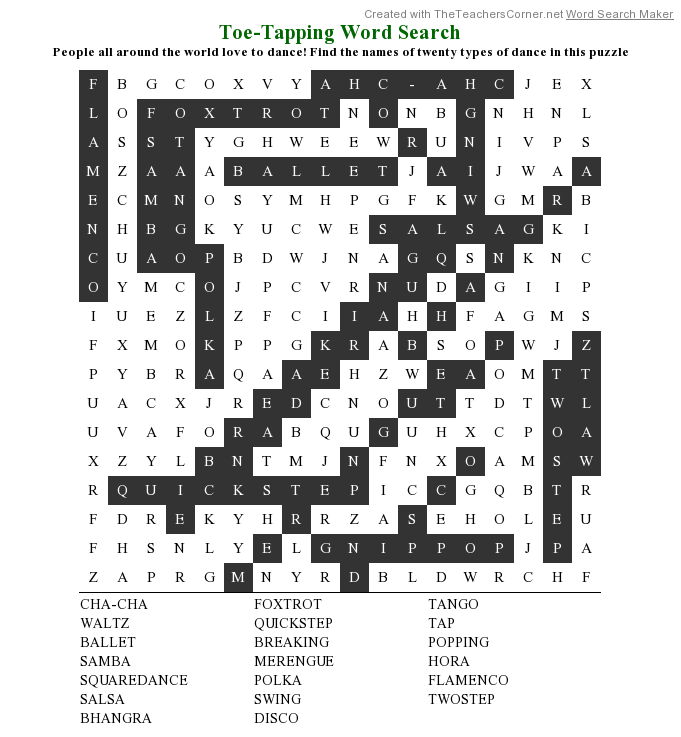 Other poems introduce the Foxtrot, Hora, Samba, Two-Step, Argentine Tango, Waltz, Bhangra, and Polka. Notes about each dance, giving a description, a bit of history, and basic rhythms and steps, follow the text. A CD of dance music is also included. Marilyn Singer begins her exuberant celebration of dances from around the world with a pair of the reverso poems for which she is well known: All Over the World, Dancing is Joy and Joy is Dancing All Over the World. With this start, Singer invites readers to put on their dancing shoes and enter ballrooms, classrooms, and outdoor spaces filled with music. From birthdays to bar mitzvahs to weddings to spontaneous parties, Singer imbues each experience with the beats, steps, and sometimes missteps of dance with expressive vocabulary and humorous asides. Reading the poems aloud offers its own special treat as the meter of each poem reflects the rhythm of the dance described. Kristi Valiant’s vibrant two-page spreads put kids in the center of the action where individuals, couples, and groups enjoy groovin’ to the music in their own style. Dancers swirl, stomp, hop, twirl, sway, dip, and kick up their heels on sunny days and under glowing nighttime light. So join in—no experience or partner necessary! For kids who love music and dance and for those who love poetry of all kinds, Feel the Beat; Dance Poems that Zing from Salsa to Swing is a fun addition to home libraries—and may spark an interest in learning how to perform these dances. Discover more about Marilyn Singer and her books on her website! View a portfolio of artwork by Kristi Valiant on her website! People all around the world love to dance! 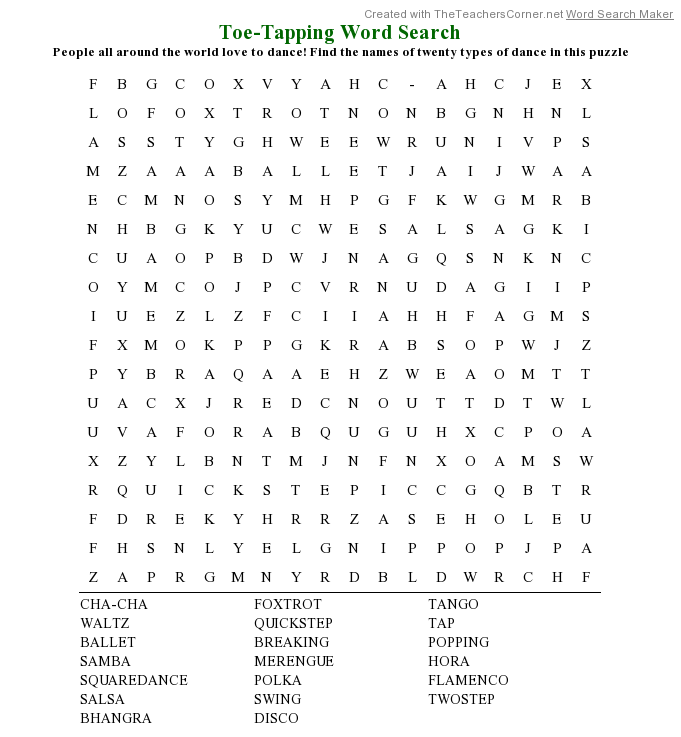 Can you find the names of twenty types of dances in this printable Toe-Tapping Word Search Puzzle? Here’s the Solution! Established in 2004, Celebrate Diversity Month encourages people to learn more about the world’s cultures and religions. Learning more about our global family and celebrating our differences and our similarities can lead to better relationships between people, more inclusion, and a happier future for the world’s children. A journey around America impresses with its natural grandeur of rocky shores, majestic mountains, quilts of fertile fields, and wide-open prairies. More inspiring than these, however, is our diverse population that lends a wealth of knowledge, traditions, language, celebrations, food, music, and experiences to our country, making it a vibrant place to live and work. Image copyright Michael Glenn Monroe, 2018, text copyright Brad Herzog. Courtesy of Sleeping Bear Press. Brad Herzog has collected twenty-six words to describe the United States and has used them to create lyrical verses and a full compendium of information about the immigrants and their experiences that have molded America from her earliest days and continue to do so today. Starting off, A is for America—that “dreamer’s destination,” and readers learn a bit about the millions of people who have come to our shores. At C for Culture and D for Diversity, children learn about food, clothing, musical instruments, and even sports that have come to be favorites and were brought here or invented by people from other countries as well as “‘the most diverse square mile’” in America. Because of our country’s innovative spirit, “K is for Knowledge. “From all over the globe, / in a quest to know much more, / brilliant thinkers come here / and continue to explore.” Want to know more? Just check out Y for how immigrants continue to advance our knowledge. Image copyright Laura Knorr, 2018, text copyright Brad Herzog. Courtesy of Sleeping Bear Press. Along the way from A to Z young readers learn more about the people, ideas, and places that define America in verses and fascinating information that expands on the history and future of the United States in letter-perfect fashion. Image copyright Pam Carroll, 2018, text copyright Brad Herzog. Courtesy of Sleeping Bear Press. Brad Herzog has created a compelling look at immigration, its history, and all the ways America has benefited from her philosophy of welcome. His fascinating informative passages and inspiring verses enlighten readers about past and present contributions by immigrants and also educate children about the law and processes involved in adopting America as a new home. Thirteen illustrators lend their talents to interpreting Herzog’s verses with images full of color and vitality that are as diverse as America itself. Beautiful scenery from around the country reminds readers of the beauty of this vast land. It is the happy, hopeful, and expressive faces of those who have come and continue to journey here looking for a better life that most inspire and reveal that we are all neighbors. W is for Welcome is an excellent book to use for leading discussions about American history and immigration at home or in the classroom. Discover more about Brad Herzog and his books on his website. There are people all over the world just waiting to be friends! 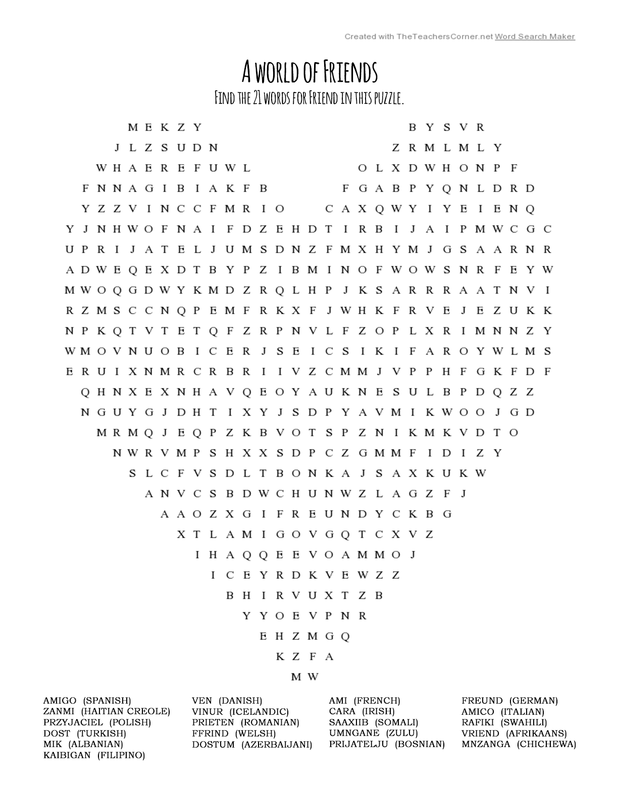 Learn how to say “friend” in twenty-one languages with this printable word search. Today’s holiday was established to encourage American workers to get away from their desk and eat lunch out with friends and coworkers. Taking a break from the office and spending lunchtime having a little fun or over a stimulating conversation can rejuvenate you for the rest of the day. Many people have also embraced the holiday as a way to remind themselves and others to eat healthy and make what they make (or order) nutritious and beneficial. To celebrate, make lunch an adventure today. You might even decide to try something new—like the little girls in today’s book! Salma and Lily were best friends. At school they did everything together in the classroom and on the playground. They also ate lunch together every day. They loved all the same things—until it came to what was packed in their lunchboxes. Lily always had a peanut butter and jelly sandwich, and Salma always had a hummus and pita sandwich. While Lily never said so, she thought Salma’s sandwich looked yucky, and Salma kept quiet about her opinion that Lily’s sandwich seemed gross. But one day, Lily did say what she’d been thinking. Salma couldn’t believe her ears. She frowned and “looked down at the thin, soft bread. She thought of her beautiful smiling mother as she carefully cut Salma’s sandwich into two neat halves that morning.” First she felt hurt; then she felt mad. Image copyright Tricia Tusa, 2010, text copyright Queen Rania Al Abdullah of Jordan and Kelly DiPucchio. Courtesy of Disney-Hyperion. Pretty soon there were shouts of “you’re weird” and “you dress dumb.” It wasn’t long before someone yelled “Food Fight!” and peanut butter, hummus, and all types of sandwiches flew through the air. “They stuck to the walls. They stuck to the ceiling. They stuck to the lunch lady.” Before anyone knew it, pudding cups and applesauce and carrot sticks were soaring through the air. Lily and Salma gazed at each other across the mess and “felt ashamed by what they saw.” After they helped clean it all up and were sent to the principal’s office, they felt even worse. The next day, Lily and Salma once again sat across from each other during lunch. At last Lily said, “‘Would you like to try a bite of my peanut butter and jelly?” Salma said that she would and offered Lily a nibble of her hummus sandwich. Lily agreed. On the count of three, Lily and Salma tried each other’s sandwiches. “Yummy! Mmmmm!” they both said, and then they traded sandwiches. After lunch they met with the principal again to tell her an idea they’d had. And on a sunny day, the school held a picnic where everyone shared their favorite lunch from their native country. The school lunchroom with its unique dynamics is a perfect setting for Queen Rania Al Abdullah and Kelly DiPuccio’s story that highlights the kinds of prejudice children can encounter whether for food choices or other differences. The inclusion of Salma’s and Lily’s thoughts about their parents is a poignant reminder of how profound and complex children’s emotions are. The humor and honesty in the girls’ relationship, thoughts, and argument as well as the food fight will resonate with readers. Salma’s and Lily’s decision to renew their friendship and try each other’s lunches and to share their revelation with their classmates leads to the kind of growth we all want for our kids. Tricia Tusa’s delicate and soft-hued mixed-media illustrations portray the joys of being best friends as Lily and Salma draw, swing, jump rope, and eat lunch together in beautiful two-page spreads. When their true feelings about each other’s sandwiches comes out, the girls are clearly reflective and then hurt and angry as they scowl nose to nose. The food fight is a double-spread free-for-all that will make kids laugh as the lunch lady seems to take the brunt of the flying food. The final gate-fold scene of the multicultural picnic is heartwarming. The Sandwich Swap is a terrific read at home and in the classroom, especially near the beginning of the school year. The book is also a wonderful prelude to a classroom or school-wide multicultural day or food fair. Learn more about Queen Rania Al Abdulla of Jordan and her global advocacy on her website. Discover more about Kelly DiPucchio and her books on her website. Get to know Tricia Tusa and view a portfolio of her books and art on her website. Take your lunch to school or work in style with this quick and easy craft! All you need is a plastic sandwich or food container, some permanent markers, and your creativity! This month we celebrate the accomplishments of women in the past who have broken barriers and forged paths for today’s women and who still inspire the leaders of tomorrow. To honor women this month, learn more about the influential woman in your own field or in areas you enjoy as hobbies and teach your children about the women who made incredible contributions to the world long ago and those who are changing the way we live today. As a child, Maya Lin loved playing and interacting with nature near her home. She and her brother liked to run over what Maya had named “the Lizard’s Back”—a hill behind her house—and into the woods. Sometimes Maya went into the woods alone and “sat as still as a statue, hoping to tame rabbits, raccoons, chipmunks, and squirrels.” She liked to play chess with her brother and build towns from scraps of paper, boxes, books, and other things she found around the house. Image copyright Dow Phumiruk, 2017, text copyright Jeanne Walker Harvey, 2017. Courtesy of us.macmillan.com. Maya’s “parents had fled China at a time when people were told what to be and how to think.” They did not want the same for their children and always encouraged Maya to be and think what she wanted. Maya grew up surrounded by art. Her father worked with clay, and her mother was a poet. Maya also liked to make things with her hands. The beautiful library where she went to college inspired Maya to become an architect. Maya was hurt by these comments, but she defended her design and, finally, it was approved. Maya worked with the architects and engineers who excavated the land and built the wall. As each granite panel was polished, engraved with the soldiers’ names, and set in place, Maya looked on. The memorial opened on Veterans Day in 1982. Thousands of people came to see it and to find the names of loved ones they had lost. As Maya approached the wall, “she searched for the name of the father of a friend. When she touched the name, she cried, just as she knew others would.” Every day since then visitors come to the wall to remember. Maya Lin has gone on to design many more works of art and architecture that can be seen inside and outside. Each piece has a name and a particular vision. Maya wants people to interact with her art—to touch it; read, walk, or sit near it; or think about it. After each piece is finished, Maya thinks about her next work and how she can inspire the people who will see it. An Author’s Note about Maya Lin and the Vietnam War Memorial follows the text. Jeanne Walker Harvey has written an inspiring biography of Maya Lin that reveals not only her creativity but the importance of creative freedom for children. Lin’s confidence that led her to enter the contest and then defend her winning design will encourage readers to pursue their dreams. Harvey’s lyrical storytelling reflects Maya Lin’s quiet, introspective nature, the influences that nurtured her creative spirit, and her dedication to inviting others to be part of her art. Dow Phumiruk’s graceful, soft-hued illustrations allow children to follow Maya Lin as she grows from a girl discovering nature, constructing cardboard cities, and learning the arts from her parents to a young woman who draws inspiration from the world’s buildings and relies on her own sensitivity to guide her. Back-to-back pages of the landscape of Vietnam and the site of the memorial connect the two places for children’s better understanding. 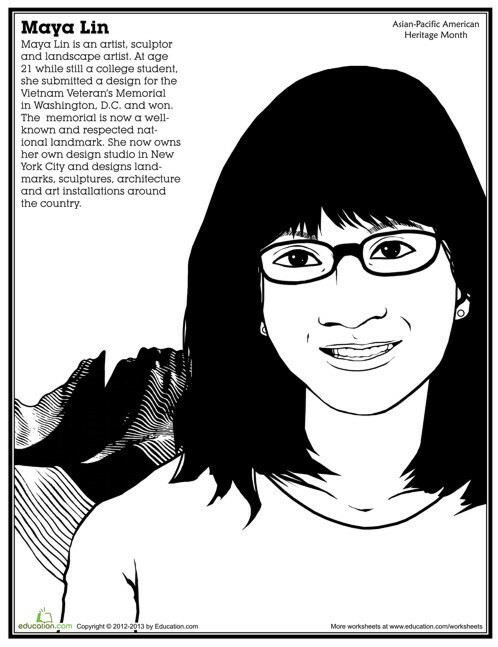 Phumiruk’s depictions of the Vietnam War Memorial also give children an excellent view of this moving monument. Her images of Lin’s other architectural work will entice young readers to learn more about her and to explore where each of these pieces can be found. Discover more about Jeanne Walker Harvey and her books on her website! Learn more about Dow Phumiruk, her art, and her books on her website! Maya Lin’s accomplishments are inspirational for all children! Here’s a printable coloring page that you can personalize and hang in your room or locker to remind you that you can reach your goals too! Established in 1977, National Handwriting Day commemorates the act of putting thoughts to paper with a pen or pencil. In this age of computer writing programs, email, and texting, the art and joy of penmanship is waning. Handwriting, though, is unique to each individual and should be celebrated and encouraged! One of the best ways for kids to develop handwriting skills is by writing letters to friends and family. Finding a pen pal either close to home or from another country is another fantastic way to make new friends that can bring joy, broaden horizons, build empathy and respect for others, and promote a lifetime love of learning about our world—just as today’s book that celebrates the ideals of Multicultural Children’s Book Day shows! Teachers know that when their students get to know other kids from nearby or far away, they gain an understanding of different traditions and cultures and develop the kinds of caring, empathy, and kindness that make the world a better place for all. Add in some poetry and the fun of sending—and receiving—letters, and you’ve got…Dear Dragon: A Pen Pale Tale—a clever tribute to creative communication and friendship. As the story opens, George and his classmates are learning about their new project. Elsewhere, Dragomir and his classmates are getting the details on their new project. And what is this new assignment? This year in each classroom the poetry and pen pal projects are being combined, so all correspondence must be written in rhyme. Image copyright Montalvo Rodalfo, 2016, text copyright Josh Funk, 2016. Courtesy of Viking Books for Young Readers. On each student’s desk is an envelope with the name of the pen pal they’ve been given. George Slair opens his envelope to discover that he’s been matched with Blaise Dragomir, and Blaise pulls George’s name from his envelope. What George doesn’t know—but readers do—is that Blaise is a dragon; and what Blaise doesn’t know—but readers do—is that George is a boy. Reading December’s letter, Blaise learns that George likes art and imagines the table-top volcano science project George writes about as a roaring, lava-spewing mountain. In January George is impressed to learn that Blaise’s father is a fire-breather. He conjures up images of a dad in a fancy, caped costume creating fire out of nothing, but the truth is a lot more explosive. February brings word that George’s mom and dad are teachers and that a pen-pal picnic is planned for June. With a growing sense of anticipation, readers know that with a turn of the page June will come, and that June brings the long-awaited picnic. How will George and Blaise react when they see each other? As the children approach the Pen Pal Picnic spot and see the friends they’ve been writing to all year, their mouths hang open and their eyes grow wide. And as the dragons peek out from behind the trees to see the friends they’ve been writing to all year, their mouths hang open and their eyes grow wide. “‘Blaise?’” a surprised George ventures, as a slice of tomato drops from his hamburger. “‘George?’” an astonished Blaise guesses, while nervously holding his tail. “‘My pen pal is a dragon?’” says George. “‘My pen pal is a human?’” echoes Blaise. In his inventive story that celebrates friendship, diversity, and the joy of discovering different viewpoints, Josh Funk shows the power of writing and communication to unite people of all backgrounds. Through the alternating letters from George and Blaise, Funk deftly demonstrates that many experiences are universal—like pets, school, hobbies, and parents—while others are just waiting to be shared. Blaise Dagomir and George Slair’s names are inspired, and may introduce kids to the ancient legends of Saint George and the Dragon and the poem St George and the Dragon by Alfred Noyes. This shout out to this well-known poem of the past further highlights the importance of reading all types of literature for both children and adults in connecting us as global citizens. 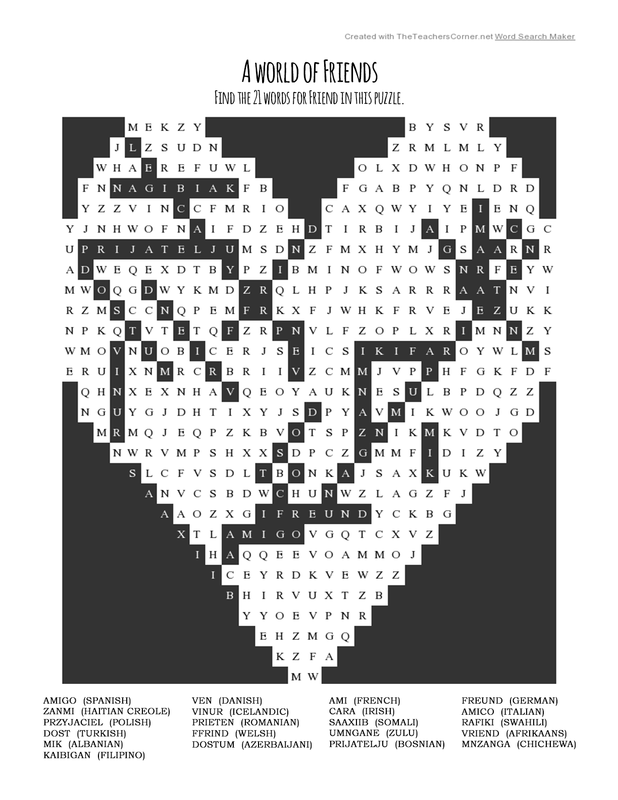 Following the alternating sequence of the letters, Rodolfo Montalvo depicts each pen pal’s perception of the message—along with the reality—in his illustrations that are, as George exclaims, “as awesome as it gets.” There is a special delight in seeing how sweet, earnest, and happily supportive of each other’s lifestyle Blaise and George are as they react to every letter. The full-bleed pages and vibrant colors dazzle with excitement, humor, and ingenious details. The final spreads build suspense as to how George and Blaise will react to each other, and the resolution is cheerfully satisfying. One striking aspect of both the text and the illustrations is the similarity between the two pen pals. While their activities and experiences may be on different scales, they are comparable and understandable to each child. Likewise, in each painting Montalvo uses complementary colors to unite George and Blaise. This cohesiveness in both words and pictures beautifully represents the theme of inclusiveness. Dear Dragon: A Pen Pal Tale is a fantastic read-aloud with multiple applications for fun and discussion at home and during classroom and library story times. Discover more about Josh Funk and his books and find plenty of fun activities to enjoy on his website. Friends say and write “hello” to each other all over the world. 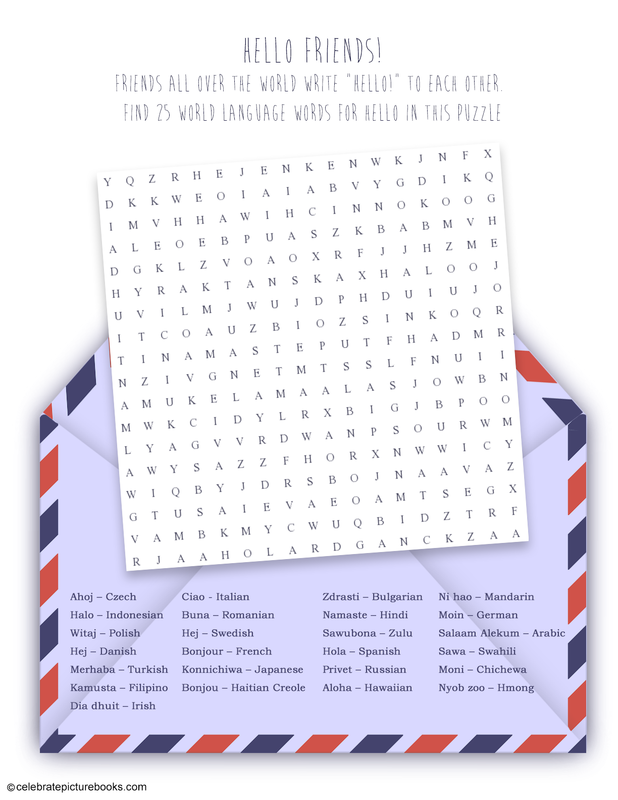 You can learn how to say “hello” in twenty-five languages as you look for them in this printable Hello, Friends Word Search Puzzle! Don’t forget to connect with us on social media! Be sure and look for and use our official hashtag #ReadYourWorld. Click here to get a FREE Classroom Empathy/Understanding Refugees Kit! Tempura is a delectable dish that originated in Japan when Portuguese Jesuits introduced the recipe in the 16th century. Traditionally, seafood and vegetables are breaded and fried, but other ingredients, including broccoli, zucchini, asparagus, chicken, and some cheeses, are also cooked tempura style around the world. The word tempura derives from the Latin word tempora, which means “times” and refers to Lenten times or Ember Days. To celebrate today’s holiday, enjoy a meal of tempura! 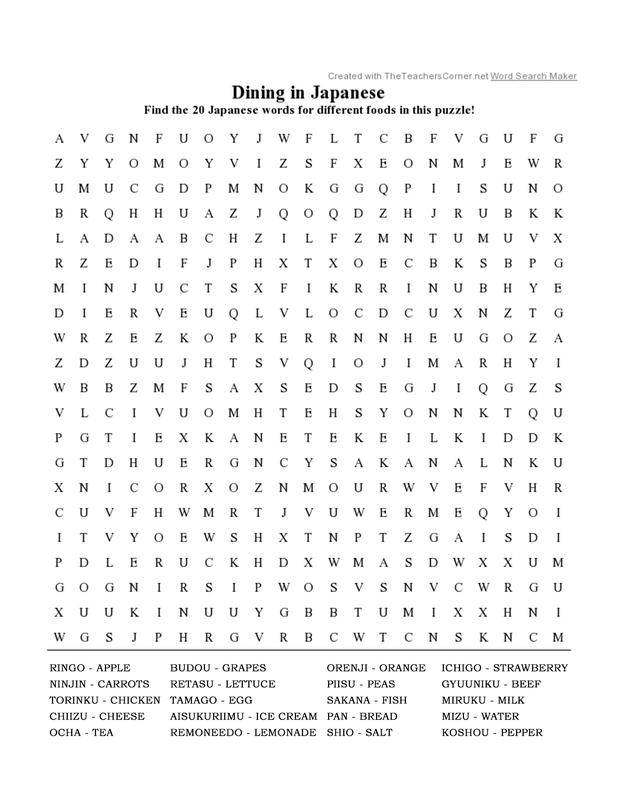 You can also learn more about the Japanese culture with your child with today’s book! Image copyright Aya Padron, 2017, text copyright Michelle Haney Brown, 2017. Courtesy of tuttlepublising.com. With language that invites readers to discover the connections between cultures, Michelle Haney Brown’s charming rhymes entice children to learn these Japanese words and will spark an interest in learning more. The verses on each page are accompanied by paragraphs that expand a reader’s knowledge of the object or idea presented. In some cases, Brown discusses the absence of particular letters or sounds in the Japanese language. Aya Padron’s paintings transport children to Japan where they can experience life at home, school, and in nature. Whimsical, tranquil, and lively scenes help young learners absorb the full meaning of the words presented while also teaching them about the culture, sights, sounds, and games of Japan. Each word is also written in Kanji (when applicable) and Kana. Padron’s illustrations glow with a love of this lyrical language and will enchant children. My First Book of Japanese Words is a superb book for young language learners and transcends its alphabet book roots to become a book of poetry that would be a fine addition to any child’s bookshelf or classroom library. Discover more books for children and adults about Japan and a host of other countries on the Tuttle Publishing website. Learning the Japanese words for some of your favorite foods is fun! 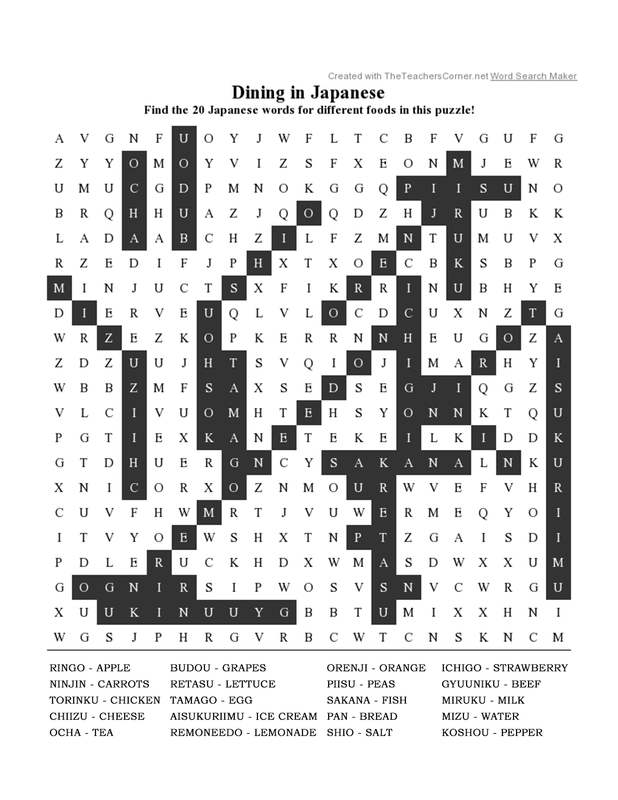 Can you find the names of twenty Japanese words you’d use while eating in this printable Dining in Japanese Word Search Puzzle? The beginning of a new year is often filled with optimism and excitement. We feel motivated and inspired to try new things, make positive changes, and accomplish goals—not only for ourselves but for the world around us. Finding new and diverse books is a fantastic way to get started. 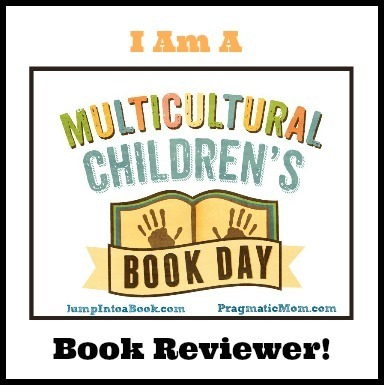 To honor today’s holiday, I’m posting a review for Multicultural Children’s Book Day, an annual event that takes place every January and, this year, culminates on January 27 with a huge online celebration. Throughout the month bloggers, reviewers, and individuals post reviews of children’s books that offer multicultural themes, characters, and stories that inspire young readers and introduce them to peers, situations, and ideas around the world. To learn more about Multicultural Children’s Day and follow the fun, visit their website and see the information below. Image copyright Charlene Chua, 2017, text copyright Jeni Chapman and Bal Das, 2017. Courtesy of gokulworld.com. The friends met at the fountain on the way to school and gathered there in the afternoons. Zoya was an artist and loved to paint pictures of “how beautiful the fountain could be.” Christopher loved to build and had “plans to fix the fountain one day.” Riya was inspired by the music of the dripping water when she played her flute, and Dalai rode his bike faster and faster as he circled the fountain. Jacob would bring his own homemade treats, and Noelle experimented with the drone iDEA that she had designed. When the friends played together they imagined that the fountain connected to all the world’s waterways and could take them on adventures. They joined hands and skipped around the fountain singing, “‘Waters of the world, connect us this day. Waters of the world, take us away.’” New Year’s Day was approaching, and the children were looking forward to the big village party. Soon, they would be helping to decorate the square. But one day, Dalai brought bad news. The mayor had canceled the party because the fountain—the centerpiece of the celebration—could not be fixed in time. The friends were disappointed, but then Christopher had an idea. If they all worked together, he thought, they could fix the fountain in time. They were all in! Riya gave each person a job to do. Noelle was to research the history of the fountain. She and Zoya were to find new orbs to replace the old ones. Christopher was going to fix the pipes. Dalai could restore the broken decorative stonework, and Jacob would keep them all working hard with his snacks. Suddenly, “the fountain glowed with extra shimmer,” and the water glistened. The orbs shone and granted each child “an extraordinary gift. Notes from Riya’s flute transformed into singing birds.” Zoya could paint pictures in the air. “The beads of Dalai’s bracelet glowed with light.” Jacob’s backpack suddenly filled with all types of cooking ingredients and utensils. Christopher’s tools grew, and iDEA gained the ability to speak. Just as quickly as they had left, the children were back at the fountain. To commemorate their magical adventure, the children decided to name the fountain “‘Friendship Fountain.’” But they had no time to waste! They made decorations inspired by all the celebrations they had seen and hung them in the town square. The next day, Gokul Village’s New Year’s celebration was the best ever. There is much to entice young readers in Jeni Chapman and Bal Das’s enriching story of six friends who have their sights set on their connections to each other and the world and the positive things they can accomplish. As the diverse group of children is introduced along with their unique talent, readers will recognize their various personalities and be eager to learn more about them. The children’s enthusiasm is infectious as they team up to fix the fountain and are rewarded with magical gifts and a special power to travel the world. Organically incorporating ideas of inclusiveness, cooperation, compromise, volunteering, and teamwork through realistic dialogue, this story is upbeat and affirmative and one that readers will respond to. Copyright Charlene Chua, 2017, courtesy of gokulworld.com. Upon opening the book to the first page, children are welcomed into the heart of Gokul Village where homes, each representing a different style of world architecture, circle the fountain. The effect is immediately inviting while introducing the story’s theme of unity. Each of Charlene Chua’s vibrant illustrations is infused with a joyful harmony as the children of diverse ethnicities pursue their individual talents while embracing each other as friends. For today’s children, the Friendship Fountain—decorated with symbols of love, direction, and world religions—is a fitting metaphor for the global community, and the friends are excellent role models. The children of Gokul have inherited a monument that they love, that can provide for their needs, and that gives them a place to come together. The children want to improve it for all the townspeople, and without hesitation, they go about fixing it. Images of the festivals the children visit are full of light and cheer, and the decorated square shows that there is room for all traditions. Gokul Village and the Magic Fountain is the first in a planned series of books and other entertainment, including digital shorts, an animated series, and interactive games that prepare “children ages 4 -7 for success by fostering exploration, understanding and celebration of cultural diversity.” The book would be a welcome and relatable addition to home and classroom libraries to foster discussions, learning, and creative projects. Discover a portfolio of illustration work by Charlene Chua on her website. Like Dalai in the story, you can make and wear a special bracelet with colorful beads that represent your friends, your dreams, or various places in the world that you would like to visit. Measure your wrist and cut a length of elastic, embroidery thread, or string, leaving it long enough to tie on the first and last beads (and make a loop clasp if using thread or string). Thread the needle with the elastic, embroidery thread, or string. Thread the first bead onto the elastic, thread, or string, leaving about a half-inch at the end. Pull end of thread over bead and tie a knot with the end and the length of string. Approximate the center of your bracelet and thread several small beads in a color pattern onto the elastic, thread, or string. Thread the medium beads onto the bracelet in the same color pattern. Follow with more small beads to finish the bracelet. Tie the last bead onto the elastic, thread, or string. To make a loop clasp on the end if using embroidery thread or string, loop the thread or string. There are friends all over the world waiting to meet you! 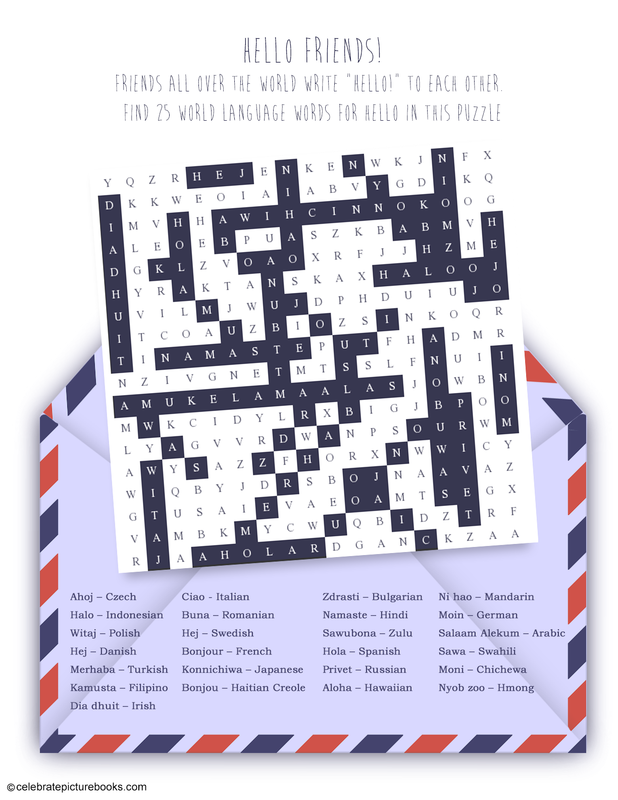 Learn the word for “Friend” in twenty-one languages and find them all in this printable A World of Friends Word Search Puzzle!